Nexleaf Analytics uses its ColdTrace vaccine infrastructure monitoring system to save lives, a project funded by Google and the Gates Foundation, and we helped them build and extend this international, ambitious Internet of Things (IoT) solution. We helped build the next generation of Nexleaf Analytics’s ColdTrace vaccine infrastructure monitoring system, which saves lives in a very direct manner. Nexleaf builds low-cost sensors for refrigerators and cold rooms and transports cell-enabled monitoring devices that transmit cold chain storage temperature and power information from remote locations around the globe to centralized servers. Nexleaf is funded by both Google.org and the Bill and Melinda Gates Foundation. The server provides real-time visualizations and reporting for instant analysis of the health, remaining life span, and potency of vaccines. 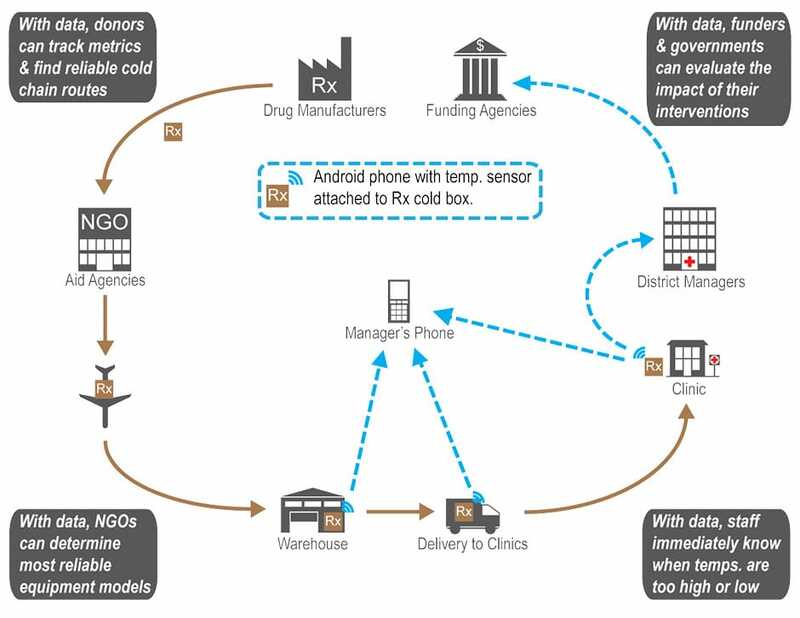 This information allows decision makers, from national ministries of health and global pharmaceutical manufacturers to the more localized technicians and nurses in village clinics to manage the distribution of life-saving vaccines so they can reach as many people as possible and manage inventory effectively. The ColdTrace dashboard provides a quick view into the health of any installation. Information is distributed by on-demand reports, scheduled summaries, and real-time problem alerts delivered by email or SMS. Centralizes real-time alerting for problems in the field so that responders can receive messages via email and SMS when prompt action is required. Previously these alarms were sent from remote devices, which did not allow easy customization and required hands-on programming to configure. Scales as the needs dictate. It supports 15,000+ ColdTrace devices in a distributed instance system, and can also scale down for a small single server installed in a remote location. Contains a hierarchical organization and group structure for managing the multiple tiers and levels found in a typical country’s health system. Provides re-engineered API code at the abstract layer to enable modules to be designed for multiple partners. Adding Celery to the Python-Django platform to allow queuing of alarms, uploads, API services, and summary reporting. Configuring the infrastructure to allow Celery to run in a distributed server model for large-scale installations. Converting from an inefficient on-demand analysis of all temperature and power upload data for generating reports and alarms to a event-recording system that allows fast generation of reports from event records. Converting system from Apache to an optimized ngix – uwSGI installation with post queues for additional scalability. Logos owned by respective owners. Presence does not indicate a partnership or endorsement. Customers served directly, or through collaboration with other firms.